Muscles free of depot fat normally contain about 20% nitrogenous compounds. Muscle tissue contains many different kinds of nitrogenous molecules ranging in molecular weight from more than 100,000 to less than 100 daltons (Chapter 2). In number, most of these compounds are classified as sarcoplasmic components because they are soluble in the muscle sarcoplasm in contrast to the proteins in the contractile apparatus (Chapter 4) and connective tissues (Chapter 5). Chemically, nitrogen-containing compounds in fish and shellfish sarcoplasm include water and dilute salt-soluble proteins, peptides, amino acids, amines, amine oxides, guanidine compounds, quaternary ammonium compounds, purines, and urea. 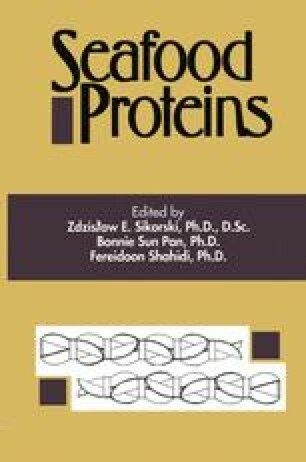 Sarcoplasmic proteins normally consist of about 20–25% of total fish muscle protein. The nonprotein-N content of fish muscle is normally higher than that of terrestrial animals ranging from 10–40% of the total nitrogen content.